Please join us to celebrate the launch of Nights of Poor Sleep, a collaborative publication from poet Rachael Allen and artist Marie Jacotey. 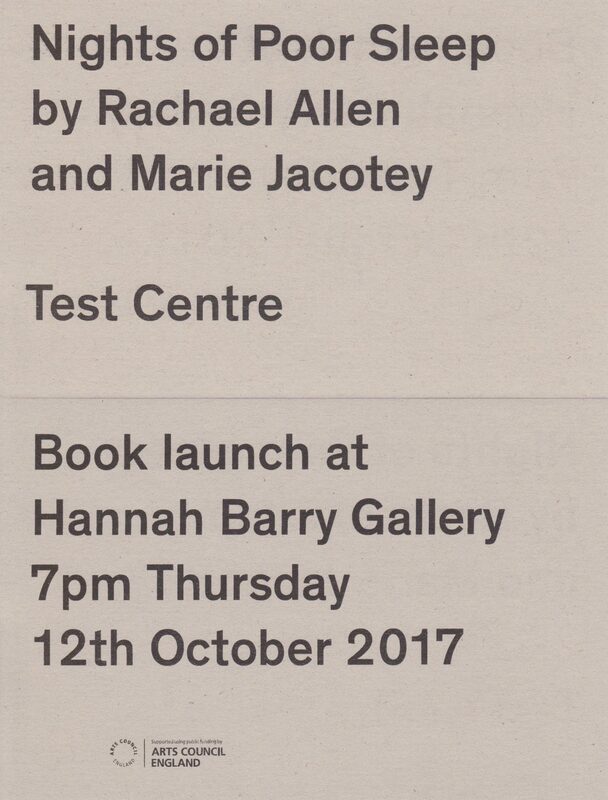 Rachael will be reading, with special guests Holly Pester, Laura Elliott and Edwina Attlee. Published to coincide with Jacotey’s solo exhibition ‘Morning Deafeats’ at Hannah Barry Gallery, Nights of Poor Sleep is an extended series of responses and engagements between the two artists’ work, showing a critical and creative engagement between the interconnected forms and processes of painting and writing poetry. Nights of Poor Sleep is supported by Arts Council England, as the first publication in Test Centre’s ACE-funded project exploring the interaction of poetry and visual art.